Yes, the car that strikes fear in many a motorist, the Panther, the P71… the Ford Crown Victoria. Two tons of V8, RWD, frame-on glory. Yeah, yeah, the 4.6L V8 is just enough to get it out of it’s own way. That’s what ADTR.net is for. 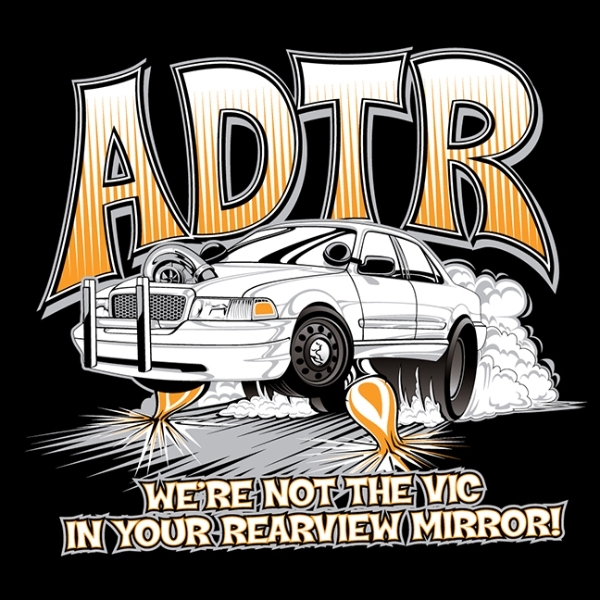 I first learned of ADTR when I came into possession of my P74 – ‘The Black Pearl’… or otherwise known as a Crown Victoria LX Sport. A good friend of mine who was selling cars at the time called to let me know that they had acquired a low-mileage ‘unicorn’ – a 2004 Sport, in Midnight Grey Metallic with dark charcoal interior. These cars came equipped with bucket seats and a console shifter, something that the P71s didn’t have, and that I really wanted. Being the forum-junkie that I am, I stumbled upon CrownVic.net, and that’s where I found Chris and ADTR. Long story short – Chris eventually hired me to create a couple fun shirts for his business. One is a typical ‘shop’ shirt that features his two beasts, the 500whp Rocket Couch, and Casper, his ex-CHP cruiser that is now supercharged as well. The second shirt is a bit more fun, I got to draw Casper in all of his Roth-esque fury. ‘The Pearl’ and I had a great 7 year long relationship, and she went to her new owner last spring, another Panther enthusiast who wanted a newer Vic and one with side air bags. I’ve moved on to a 2012 Ford Focus (my 4th, guess I should have a side-blog about my old project cars), but oh man, I miss my Pearl dearly. Two friends, made up two different an separate names for my Black, 2000, CVPI. One calls it “Intimidator” an the one other calls it “Tornado” ( Zorro’s horse name).